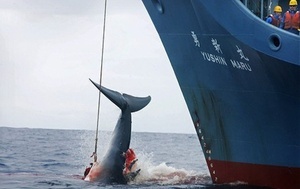 Japan's whaling fleet is believed to be quitting the Antarctic under heavy conservationist and diplomatic pressure, just halfway through its worst season. The Japanese government has decided to cut short the season and the fleet is heading back to port, sources in Tokyo told the International Fund for Animal Welfare. The sudden departure has raised hopes Japan may be moving to end its widely opposed, 23-year-old "scientific research" program, which has killed about 10,000 Antarctic whales. "Under pressure from all fronts, the Japanese whaling fleet is apparently withdrawing early this season from the internationally recognised sanctuary around Antarctica," said IFAW's global whales campaign director, Patrick Ramage. "We hope this is a first sign of Japanese government decision makers recognising there is no future for whaling in the 21st century and that responsible whale watching, the only genuinely sustainable use of whales, is now the best way forward for a great nation like Japan," Mr Ramage said. The Chilean government said it planned to use naval assets to monitor the approaching factory ship closely. Chile has permanently banned whaling in its waters, and also forbids the transport of cetacean parts through them, but Nisshin Maru should be able to navigate Drake Passage without entering the Chilean exclusive economic zone.